We've added some exciting new fast touring kayaks to our website. The Kayak pro Nemo and Namu, both designed by South west resident and boat designer extraordinaire Rob Feloy. The Nemo is designed as an ultra fast sea and touring kayak, that also complies with Sea Kayak racing regulations. Speed is definitely the key with the Nemo, if you want to do some rock hopping, or even intend to land on a few rocky beaches, then you'd better look elsewhere, but if you want to get from A to B as fast as possible and not have to lugg about a heavy boat, then this is the boat for you. The Nemo is made from a Full Carbon/Kevlar sandwich construction, and is fully vacum bagged and heat cured for the ultimate in lightweight and stiffness. The Nemo weighs in at an amazing 15.5kg! It comes with a easy to use and smooth to operate Smart track rudder system, two hatches with bulkheads, and an adjustable composite Italian style race seat. The Namu is shorter and wider than the Nemo, but shares much of the same features. 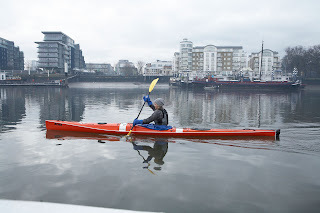 Designed to be stable and easy to paddle, but still quick and effortless the Namu is a great Recreational and light touring kayak. It is suitable for paddlers all the way from beginners upwards, and comes in a range of sizes to accommodate all sizes. The Namu is available in two different constructions, either the Light weight 'Racer' construction the same as the Nemo or in a 'club' construction, made from a Glass sandwich, but also Vacum bagged and Heat cured. The Namu has all the same great features, a smart track rudder system, two hatches and and adjustable composite Italian style seat. The speed and stability of the Nemo has already attracted some people. The BBC Blue Peter presenter Helen Skelton is currently paddling a Nemo down the Amazon, to raise money for sport relief. If she completes the challenge, she will be the first women to have solo paddled the entire length of the Amazon. You would be forgiven if you thought we had swanned off to the tropics for this. We have some of the most amazing paddling in the UK right on our doorstep! Wether its salty or fresh water get out there and enjoy it! Our all new 2010 Kayak and sit on top package deals are now online. We've got packages for the beginner, intermediate and expert alike. As well as packages for juniors, and a kayak fishing specific package. Why not check them out on our website now and see what you could be saving. We've also added some discounted tuition as well, if you buy either a Dagger Blackwater 10.5 package, a Dagger Approach package, or a Pyranha Fusion package, you could get a full days coaching from our highly trained and experienced coach for just £25. What more could you ask for to get you started? 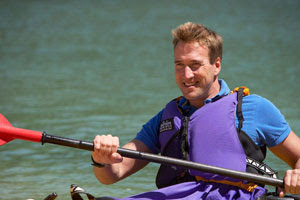 BBC TV presenter Ben Fogle has been working his way around the UK in the Series Country Tracks. This weeks episode saw Ben start off in South Devon with some Kayak Fishing. Ben can be seen paddling an Ocean Kayak Big game whilst fishing off of the south Devon coast at Exmouth. Ben Met up with Fly fishing guru Nick Hart, to get some expert tips. Nick was paddling a Native Watercraft Manta Ray 14. All of the paddling gear was loaned to them by us here At AS Watersports. Check it Out in the BBC IPlayer: Country Tracks kayak Fishing. Recently revived and reinstalled on our website, possibly the most addictive kayaking game ever, Kit and Kaboodle, is back. Why don't you check it out on the main site now KIT AND KABOODLE. Just a couple of shots from recent River Dart action. Below: Liam (a.s staff) takes the classic line through Euthenasia, Upper Dart, water levels: just below the slab at Newbridge. Ewat takes the Pyranha Fusion s for a pre work dawn run down the Loop. Yes it was dark and cold. Perfect pre work wake up call! Yes Yes Yes, Finally another Pots rodeo! The last Flower Pots rodeo was a few years ago now but with the help of Exeter Uni canoe club it is back! The best news is the event is now open to any one over the age of 18. If you would like to entre then get in touch with the Uni team and they will tell you how to get involved. Big Lights, Big sounds, Big moves and a Big party student style! A fun evening of paddling and partying in aid of Sport Relife. 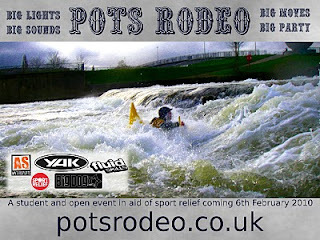 The event is taking place at Flower Pots weir on the River Exe next to Mill on the Exe pub on the river left play hole. If there is not enough water then there will be a Boater Cross event instead. (This may happen as well any way). Full support for this event comes from A.S watersports, Yak paddling equipment, Big Dog kayaks, Fluid Skills and Jamthechannel. 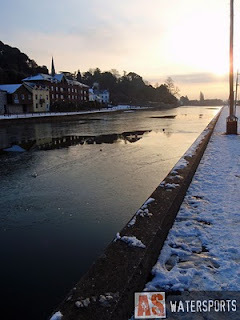 The River Exe freezes up. Unless you live in a foreign country you can't have failed to notice that its cold at the moment. 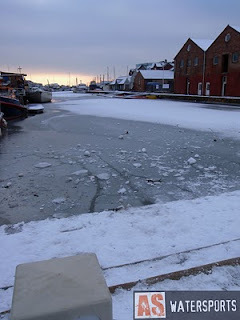 So cold in fact that the River Exe has started to freeze up. 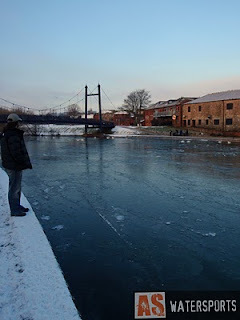 It's not too uncommon to see the Exeter ship canal start to ice up, but it's not very often that the river does. Other rivers in the UK freeze, highland rivers in Scotland regularly ice up during winter, but for us this is something uncommon. 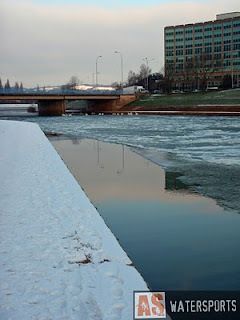 Down in the 'Sunny' southwest hard winters like this aren't common, and here at the shop we are barely 15m above sea level, so to get weather so cold that the river freezes up is a unusual occurrence.